After winning the Big 8 and NorCal titles last season, the men’s track and field team at American River College is now gearing up for another big season. The team officially kicked off its season on Feb. 22, at the Diablo Valley College Invitational in Pleasant Hill, California. The team has competed in six events so far, as they have just barely began its season. For head coach Rick Anderson, the goal this year is to not only repeat last season’s results, but to exceed them. “Our hope is always to repeat as conference champions, and to win the NorCal Championship which we have won about eight years out of the last 10,” Anderson said. Despite placing high in the in the California Community College Athletic Association Championships in 2018, with sophomore Myles Ellis earning second place in the 400 meter-dash, a CCCAA title is not as high a priority to Anderson and his athletes as a NorCal or conference title does. Ellis’ best event last year was the 400-meter dash, winning first place in his conference in addition to earning second at CCCAA championship. Despite a stellar debut season, Ellis believes there is more to be desired. Another standout from the team is sophomore Brett Lombardi, a decathlon athlete who is a defending CCCAA champion in the 1500 meter run category. Although Lombardi is a champion and believes he has started off strong this season, he admits there is still plenty to work on. Never being fully satisfied with results is known as a hallmark of a great champion. 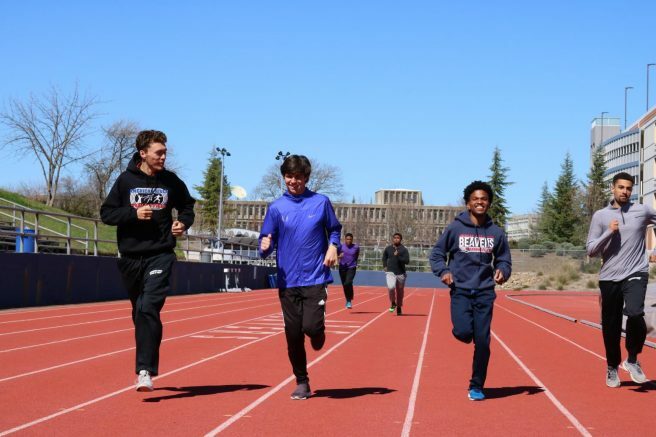 With young athletes like Ellis and Lombardi, who achieve great results but alway strive to be even better, the track and field team is likely to win even more events and championships this season. Be the first to comment on "Track and field aims for more after Big 8 and NorCal titles last season"